A woman says she felt ‘chills up her spine’ after spotting a UFO. 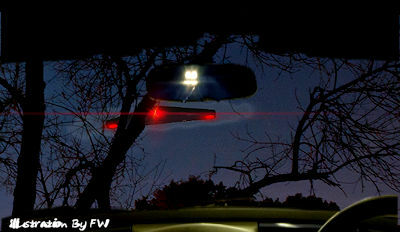 Suzanne Riley claims she watched a black craft hover over trees while driving home from work on Saturday. “I was staring at it in shock thinking ‘what the hell is that!’” said Suzanne. “Cars around me were stopping and I nearly hit the man in front in a red car who had jumped out with his phone. “I can’t stop thinking about it”. Suzanne claims that a military aircraft arrived moments later. She described the silent aircraft as having a “triangular angled” appearance, and said it had no obvious windows or doors.